Officials from The University of Alabama, the Alabama Governor’s Office and the Alabama Department of Conservation and Natural Resources met with members of the Drummond family Oct. 27. 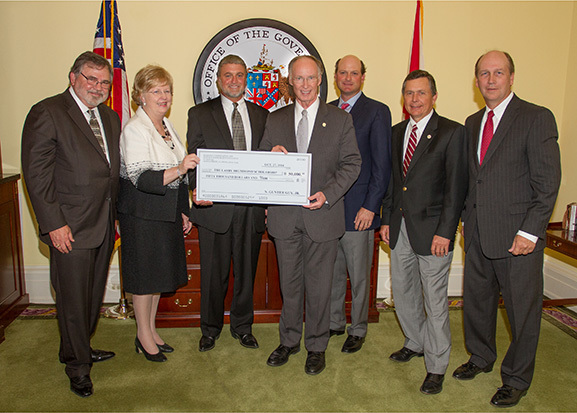 Pictured from left to right are Dr. Robert Olin, Dr. Judy Bonner, Scott Drummond, Governor Robert Bentley, Patrick Drummond, Commissioner Gunter Guy and Dan Moultrie.  From the November 2014 edition of Desktop News | The Alabama Conservation and Natural Resources Foundation has donated $50,000 to the College of Arts and Sciences to establish a scholarship in memory of UA alumnus Larry Drummond. The scholarship was made possible from proceeds of the Alabama Governor’s One-Shot Turkey Hunt fundraiser hosted by the foundation earlier this year. Larry Drummond, a Birmingham native, was an avid outdoorsman and Alabama businessman. With his brothers, he helped grow Drummond Co. Inc., founded by their father, Herman Drummond, in 1935, to one of the largest international coal companies in the nation. Larry Drummond was inducted into the Alabama Business Hall of Fame and the State of Alabama Academy of Honor in 2011. Dan Moultrie, chairman of the 2014 Alabama Governor’s One-Shot Turkey Hunt and member of the foundation, said Drummond’s passion for hunting and conservation were well known. Drummond graduated from UA in 1965 with a bachelor’s degree in commerce and business administration. He also received from the University a master’s degree in accounting in 1966 and a juris doctor in 1969. An active member in his community, Drummond served in many civic and professional organizations, including the Alabama Bar Association, the American Bar Association, the board of visitors of the Culverhouse College of Commerce and The University of Alabama President’s Cabinet. He also served on the boards of directors of numerous organizations, including the Walker Area Community Foundation, the First Commercial Bank, the American Family Business Institute, the Alabama Business Hall of Fame, and the Alabama Conservation and Natural Resources Foundation. He is the former director of the Black Warrior Council of the Boy Scouts and a former member of the United Way of Central Alabama’s Le Societe National. The Alabama Governor’s One-Shot Turkey Hunt is designed to showcase the state as a destination for business, industry and nature-based tourism.